A mental health trust planning to close beds has spent more than £1m sending patients to a private hospital linked to one of its senior consultants. Norfolk and Suffolk NHS Foundation Trust spent almost £1.2m in 2013 with Milestones at Salhouse, near Norwich. Milestones' medical director Dr Julian Beezhold is a consultant psychiatrist at the trust and has played a role in its bed-closure programme. The trust said all its placements were audited externally and internally. The Campaign to Save Mental Health Services in Norfolk and Suffolk voiced concerns about the possible perception of a conflict of interests between Dr Beezhold's roles and called for an investigation. However, there is no evidence that his role with Milestones has had any impact on the trust's decisions on bed closures or that he has acted inappropriately. Dr Beezhold, secretary general of the European Psychiatric Association, declined to comment on the trust's spending and referred inquiries to the trust. Milestones is a 10-bed "holistic mental health hospital" for women detained under the Mental Health Act and is a trading name of The Atarrah Project. Dr Beezhold, a shareholder and one of two company directors, is understood to spend one day a week there. The trust said it spent £1,180,290 placing seven patients with Milestones during 2013. That represents almost half its total spending of £2.6m on specialist placements during the year. Norfolk and Suffolk NHS Foundation Trust was formed in January 2012 by the merger of Norfolk and Waveney Mental Health Trust and Suffolk Mental Health Partnership. In October 2012 it revealed up to 500 jobs could be lost as part of its "radical redesign" of services, aimed at saving £40m over four years. In December, campaigners called on its board to take urgent action to avert a "serious crisis" or resign. In January Norfolk County Council announced it was resuming control of social care for adults with mental health issues because of the trust's poor performance. 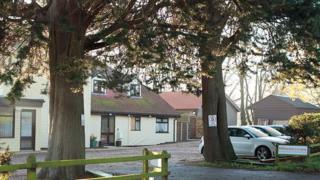 In February the Care Quality Commission said the trust was failing to meet expected levels of care at Hellesdon Hospital, near Norwich. Last week a report by Healthwatch Norfolk and the University of East Anglia found that a lack of beds for children and young people was leading to "high levels of risk". The trust said it was working to address these issues. The trust, formed in 2012, has been repeatedly criticised over standards of care. It is currently undergoing a "radical redesign" to save £40m over four years by cutting staff, beds and services. In a statement, a spokesman for the Campaign to Save Mental Health Services in Norfolk and Suffolk said: "Dr Beezhold is the lead clinician recommending and overseeing the closure of NHS beds within the acute pathway." The campaign voiced concern about the possible potential of a conflict of interests with his role at Milestones, suggesting it "undermines the 'radical redesign' consultation, given his role at the heart of it". It called for a "thorough investigation" of the trust's spending on specialist placements. "It is imperative that all NHS staff are working exclusively and transparently for the NHS, particularly those such as Dr Beezhold with senior managerial and clinical responsibilities," its spokesman said. He questioned whether CCGs (clinical commissioning groups) and other bodies had known about Dr Beezhold's involvement with Milestones when he presented evidence to them. The doctor has appeared before councillors to defend the cuts, and in January addressed Norfolk's health overview and scrutiny committee. David Bradford, a Labour committee member, and Margaret Somerville, a Conservative member, both said they had been unaware of Dr Beezhold's involvement with Milestones. Mrs Somerville said: "Dr Beezhold is an eminent psychiatrist who cares deeply about his patients. "I have no problem with somebody being involved in a private hospital but it's better to have the information out in the open so there is no perceived conflict of interest." Jeff Keighley, of Unison, said any trust employee with contracts for private services within the trust should be forced to declare this when appearing before a scrutiny committee. "I urge county councillors, CCGs and the trust to review this and ensure full transparency is achieved," he said. "If other employees of the trust are in a similar position, there needs to be explicit clarity on this issue." Andrew Hopkins, the trust's acting chief executive, said it made a number of "highly specialist" placements every year and Milestones was one such provider. "Our trust makes these placements when it does not provide the services itself, adhering to NHS rules for the procurement of services. All such specialist placements are subject to internal and external audits," he said. "The trust does not believe that the public would wish us to prevent service users from receiving appropriate care." Asked whether any trust staff with a financial interest in Milestones had been involved in decisions to place patients there, he said: "All staff are expected to abide by the code of practice in respect of private practice and to declare their interests and outside work on the public declaration of interests register. "This means that they have no role in the process of the trust approving a placement of any service user at Milestones." Dr Beezhold's position as medical director and "investor" with The Atarrah Project is recorded in the trust's register of interests.